Archives : BULLISH TAKURI LINE FORMATION - 23/08/2013. 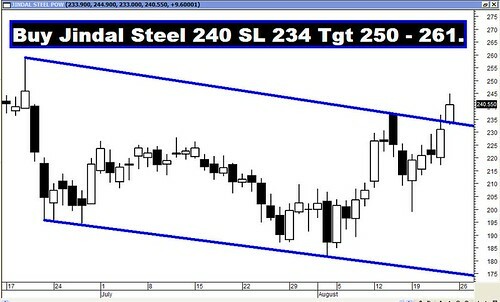 BULLISH TAKURI LINE FORMATION – 23/08/2013. After two weeks of relentless fall, finally the market managed to bounce back from lows of Sensex 17759 and Nifty 5254. Currently the market is undergoing a retracement or a correction of the sharp fall observed over the last two weeks and the levels for that are Sensex 18383-18576-18768 and Nifty 5445-5504-5563. The market went up on the back of Rupee rebounding as it managed to gain over 2% on Friday. By all means this should be considered as a mere Pull-back rally and not a Trend Reversal. This week the Bullish Rising Gap between Sensex 18284 – 18062 and Nifty 5526 – 5447, which had been providing long term support to the market, has been filled. Hence as per the Gap theory, the long term trend has now turned down. Sensex opened the week at 18587, made a high of 18587, low of 17759 and closed the week at 18519. Thus it registered a weekly loss of 79 points. At the same time the Nifty opened the week at 5497, made a high of 5504, low of 5254 and closed the week at 5471. Thus the Nifty went down by 36 points on a weekly basis. On the daily charts, both Sensex and Nifty formed a Last Engulfing Bottom on Wednesday which is a bullish reversal pattern. Confirmation for this was given in the form of a white body candle on Thursday. Friday too managed to form a white body candle. On the weekly charts, both Sensex and Nifty have formed a Takuri Line formation which is also a bullish reversal pattern. It belongs to the family of Dragonfly Doji. The long lower shadow signifies buying at lower levels. Thus both the daily and weekly charts suggest a pull-back in the short term. Market managed to bounce back after making a low of 17759 on the Sensex and 5254 on the Nifty. Currently we are witnessing a pull-back or retracement of the immediate fall from Sensex 19392 to 17759 and Nifty 5754 to 5254. The pull-back levels are Sensex 18383-18579-18768 and Nifty 5445-5504-5563. On a higher timeframe we need to consider the fall from Sensex 20443 to 17759 and Nifty from 6229 to 5254. Corresponding pull-back levels are Sensex 18784-19101-19418 and Nifty 5628-5741-5856. One of the most significant supports for the market, the Bullish Rising Gap between Sensex 18284-18062 and Nifty 5526-5447, was breached last week. Now as per Gap theory the long term rally is over and the long term trend has also reversed. This week both Sensex and Nifty maintained below the long term average of 200dma (Sensex – 19337 and Nifty – 5844), medium term average of 50dma (Sensex – 19237 and Nifty – 5756) and the short term average of 20dma (Sensex – 18956 and Nifty – 5620). Thus the trend in the short term, medium term and long term timeframe continue to remain bearish. MACD and ROC both continue with their Sell signal besides being negative. RSI (42) has moved higher but is still in Sell mode, suggesting that the bearish momentum is high. Stochastic Oscillator has given a Buy on Thursday as %K (25) went above %D. MFI (41) has improved but is still below the equilibrium line which suggests money flowing out of the market. ADX has improved to around 24 suggesting that the current trend is now gathering strength. The Directional Indicators continue with its Sell signal as -DI is above +DI. OBV continues to make lower top lower bottom formation and hence it remains in its Sell mode. Bollinger band also continues with its Sell signal. Thus majority of the Oscillators points towards bearishness to continue in the near term. The Nifty O.I. PCR has reduced and is now at 0.88. For the current month series, highest Open interest build up has shifted to 5300 Put and 5600 Call. This suggests that the market expects a trading range with support coming in at 5300 levels and resistance around 5600 levels. Friday saw high amount of Put writing at 5400 strike which suggests immediate support to come in at that level. The Trendline Resistance for the Sensex is at 18753. The Trendline Support for the Sensex is at 17368. The Trendline Resistance for the Nifty is at 5641. Trendline Support for the Nifty falls at 4958. For the week ahead, Sensex will find Support at 18255-17972-17631 and will find Resistance at 18802-19093-19392. For the week ahead, Nifty will find Support at 5378-5260-5177 and will find Resistance at 5566-5666-5754. All the Recommendations given in the previous week reached their targets with ease. However the Star Performer of the week was M&M which went up by around 11%!! !